Login to your WordPress dashboard and click on Plugins > Add New. Search for UpdraftPlus by typing into the search box. Next, click on Install Now button and follow by the Activate button. 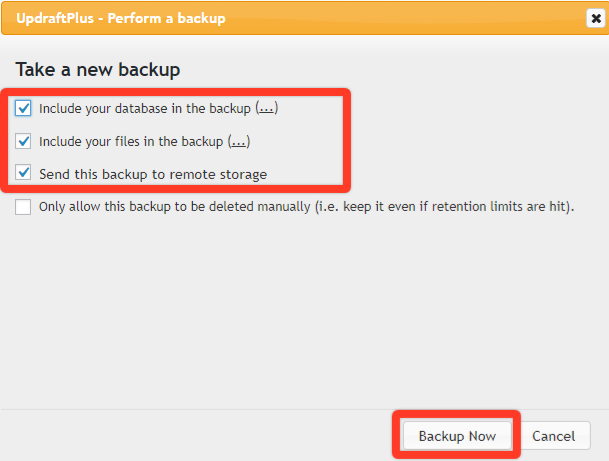 To set up UpdraftPlus, select Settings > UpdraftPlus Backups from your WordPress menu. This will open the UpdraftPlus Backup/Restore page, where you can customize the UpdraftPlus settings to suit your backup needs. You can also choose how many previous backups to save. When you are happy with your backup schedule settings, remember to click on Save Changes at the bottom of the page. It&apos;s time to specify where you want the backup file to be stored. In this example, instead of downloading to our own computer, we are going to use Amazon S3 to store our backup file remotely. Select the Settings tab again and scroll down the page to Choose your Remote Storage. The integration settings for the solution you have chosen will then appear further down the page. Now you need to sign up for a new Amazon (AWS) account or sign in to your existing AWS account (if any). 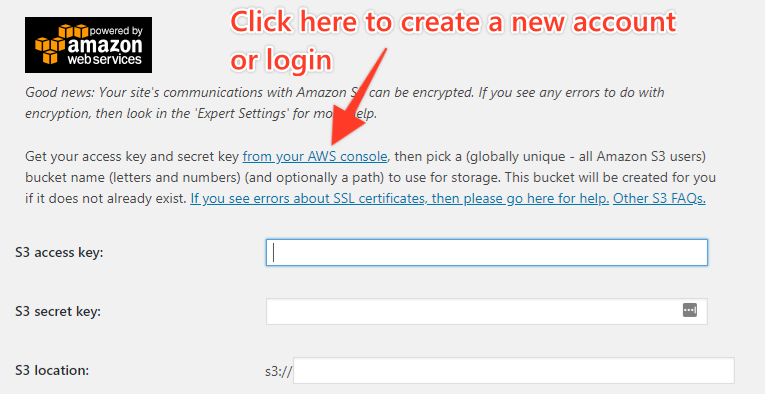 Click the link as highlighted to be redirected to the AWS sign in page. Once you&apos;ve logged in to your AWS account, you shall be prompted with the following message. Click on " Continue to Security Credentials "
Under Your Security Credentials page, click on the Access keys (access key ID and secret access key). Next, click on the button "Create New Access Key". Click on Show Access Keys. You will be shown both Access Key ID and Secret Access Key. Copy these 2 information down and then click on the Close button. Next, go back to Settings tab, scroll down and fill up both Access Key and Secret Access Key as shown below. Now we need to fill up the S3 Location. We need to go back to our AWS console and click on " Services " > " S3 ". Create your own new S3 bucket by clicking on Create Bucket as highlighted below. 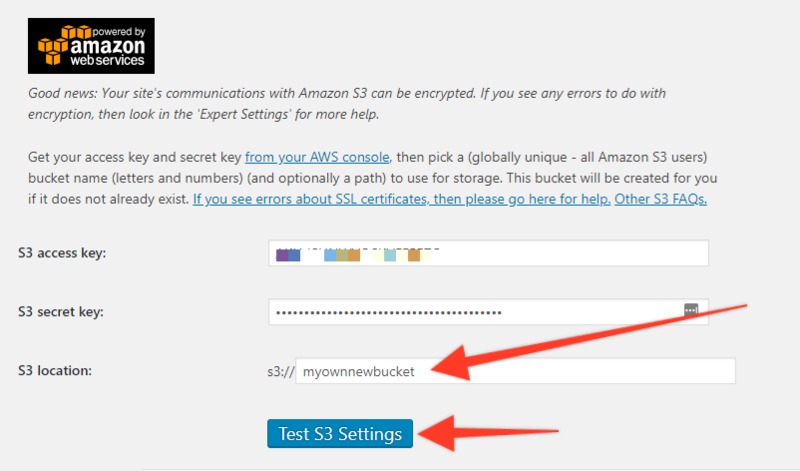 Now insert your newly created S3 bucket name as follow and press the Test S3 Settings button. Press the OK button and scroll down to the bottom to press the Save Changes button. Now you&apos;re all set to generate backup and store your backup file at remote storage i.e. Amazon S3 bucket. For manual backup, you may click on the " Backup / Restore " tab and click the Backup Now button to perform backup generation. Click the Backup Now button once again to proceed.